“Alone we can do so little; together we can do so much” –Helen Keller. The ability to simultaneously perform as an individual and together is effective teamwork. It is a key to attain growth and success. Teamwork is important in life to accomplish the overall objectives of any organization. Individuals possess diverse talents, weaknesses, communication skills, habits, and strengths. Working in a team amalgamates these characteristics into one. A better goal in harmony is achieved more efficiently and effectively. The synergy of individuals is a powerful and strong instrument but working alone seldom brings glory. It generates performance greater than the sum of the performances of its individual members. Celebrating an achievement with teammates is a great way to boost morale. A team always accomplishes tasks faster and more efficiently than an individual endeavor. It reduces workload and enables them to share responsibilities or good ideas. Teamwork reduces work pressure of individuals which allows them to be competitive and deft. With strong resources, the efficiency increases and the happiness and satisfaction elevates team spirit. Imagine all eyes glued at the last person batting on the crease and ‘ a never say any’ attitude of the last batsman. What he does is for the team is his team work instinct that develops into a divine quality. Many intelligent minds and brains while working together in a team can learn the skills and capabilities of each other and become more knowledgeable, patient and cooperative. Many new workers can learn from experienced, skilled co-workers or seniors. With buzzing ideas, conflicts may arise as well. Co-operation among other members of the team is very important. This can take turn into healthy debates where the best Idea wins. it is a win-win situation for everyone in the team as it is ultimately an accomplishment common to everyone. There can be healthy discussions, questionnaires, answers that make concepts easier and smarter. Certain mistakes can be avoided and focus can be on positive work outcomes rather than negative work culture. With team comes trust which is a strong motivating factor at times of a catastrophe. The crux may lead to very stressful situations which can be efficiently overcome if the team members address it in unanimity. It provides employees with the opportunity to bond with one another and improved relations among them. Along with the team spirit what grows and grows deep is the respect for co-workers. We often learn from others’ mistakes. We gain insight from different perspectives and learn new concepts. Students engaged in group work and cooperative learning show entries individual achievement compared to those working alone. When teammates interact and discuss with one another a new knowledge is constructed which is placed within a conceptual framework of existing knowledge and then refined and assessed on what they know and do not know. Good communication skills are integral to any team success and the overall success of the business. Clear communication by the leader makes things evident so that their deadlines are less stressful and objectives have met an accident with ease. Communication skills foster trust between teammates. It creates an environment for positive professional relationships to take root and grow. They become acquainted with each other’s strengths, weaknesses, and thought-process which makes it easier to work together towards a common goal. 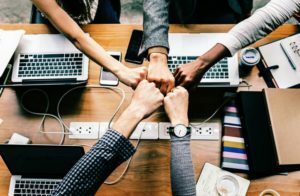 Good team communication skills are not simply about assigning tasks for troubleshooting problems, it is also about creating a culture of celebration in the workplace. Creating a good team is like cooking a gourmet meal. It requires right workers as ingredients and they have to be blended together in the correct way. A team cannot thrive without its members all having the roles and responsibilities that suit them the best. Without a leader to guide, a team has no foundation. Leaders serve as the backbone of teams from their roles in specifying goals, setting up work sessions and meetings, to keep an eye on goal achievement. The objective of a team leader is to establish an atmosphere conducive to success. Similarly, there is members of the team have to take various roles, for example, of a networker, a cheerleader, a secretary and so on. Along with the perks of teamwork comes a few challenging aspects as well. There can be conflicts of ideas, blame shifting taking advantages of fellow workers and attitude problems. These challenges with good leadership skills, a patient ear. Counting the benefits of a project and the growth of individuals from a team is a positive impetus. Teamwork is an inevitable part of the growth in all fields of life may it be students, entrepreneurs, sports or a humble job. Together we stand, divided we fall sums up this entire essay so well. #Why is Teamwork Important In Business? Copyright © 2019 My Essay Site.